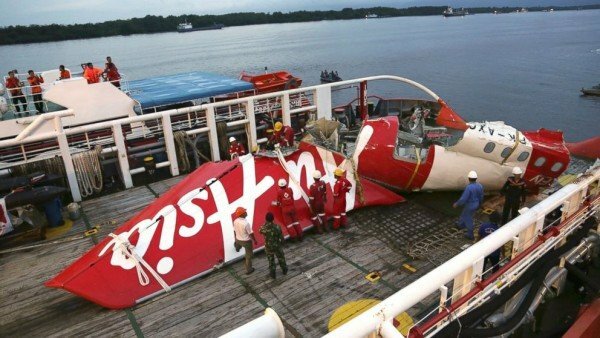 According to Indonesian officials, a faulty component was a “major factor” when an AirAsia plane crashed into the Java Sea in December 2014, killing 162 people. The first major report into the crash found that actions by the crew in response to the malfunction also contributed to the disaster. The Airbus A320-200, going from Surabaya to Singapore, was 40 minutes into the flight when contact was lost. The report is the result of a year-long investigation. Investigators had initially indicated that bad weather was a major factor in the crash. However, the new report has found that the soldering on a tiny electronic part in the system that controlled the rudder was cracked, causing it to send four warning signals to the pilots. The crew tried to fix the problem by resetting the computer, but this disabled the autopilot. They then lost control of the plane. The AirAsia plane then entered “a prolonged stall condition that was beyond the capability of the flight crew to recover,” said Indonesia’s national transport safety committee. Maintenance crews were aware of the problem as it had occurred 23 times in 2014, and resetting the system was one of several methods used previously to address it, the report said. AirAsia CEO Tony Fernandes thanked investigators on Twitter and added that “there is much to be learned here for AirAsia, the manufacturer and the aviation industry”. The plane’s wreckage was found days after the crash at the bottom of the Java Sea near Borneo. Most of the passengers were Indonesian, and others on board included a Frenchman, a Singaporean, a Malaysian, a Briton, and three South Koreans. Only 106 bodies have been retrieved so far. The AirAsia crash capped a year of major air disasters including the disappearance of MH370 and the shooting of MH17- both flights operated by Malaysia Airlines.